This morning, August 13, 2005, I have pledged to myself that I will not leave my basement office until I have started and finished this update. To the regular visitors to this website, I apologize for the extended lapse. Please be confident that the paucity of fresh updates does not reflect idle and rusting equipment at Mt. Mica. In fact, the opposite is true. So much so, that I have nearly abandoned my day job… in the flesh but not in the spirit. It was during these asides to Florida that I would discharge my frustrated mining tensions by writing updates. Therefore, I ask that you overlook the dangling participles, run on sentences, and other atrocities perpetrated against the written word as I force out this update. Enough said…. We resumed working at Mt. Mica March 15th. Needless to say, although we were hot to get started, the weather was not. 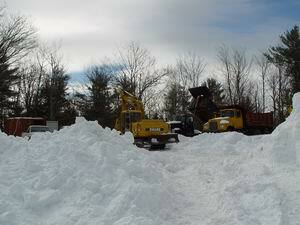 Our first act was to punch through the ice with our excavator bucket and commence pumping. Once the water was out, we dug and trucked out the ice. To our surprise in two days we were ready to start mining. As noted in previous updates, we had temporarily switched from open cast mining to underground work. Two years prior, we had received our MSHA required 40 hours of training from Jim Clanin, the well known San Diego and Africa gem miner. 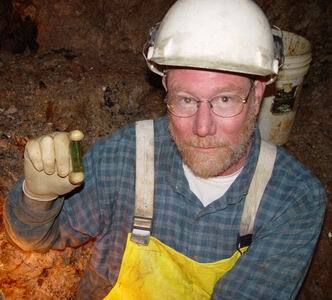 Jim is a geologist and mining engineer and has extensive underground experience working for gem. I had reached an agreement with Jim to join Coromoto Minerals, LLC but he would not be arriving in Maine until early April. In the interim Richard and I decided to take up where we had left off in January when we were frozen out. Our initial effort at Mt. Mica to work underground had led us to pocket 27, a small gem pocket, and the 6m fabulous pocket 28-4. 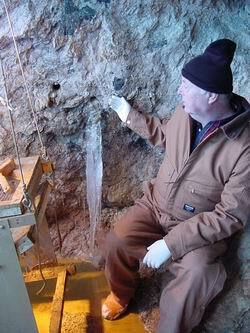 What struck us was the intensification of the mineralization as we worked toward 28. The amount of lepidolite and spodumene was more than we had seen out in the pit. Since there was so much in the walls of the adit, we decided to drill a number of exploratory holes in the ‘sweet spot’ above the garnet. On the up strike (East) side of our adit we did in fact drill into a small pocket. Our final effort in January was to open this pocket but the weather intervened before we could properly complete this task. We started 2005 mining at this spot by starting a drift eastward. As we continued advance our drift, our strategy was to drill a 1m square burn pattern a safe distance abovet the mineralized zone. Once the burn was cut, we would then enlarge this opening to the final width of the drift but still keeping the bottom of the opening well above the pocket zone. We learned quickly that if we found the ‘roots’ of large accumulations of schorls showing in the floor of our cut, we could predict with a degree of certainty that a pocket was underneath. This was especially true if there was a halo of quartz and cleavelandite around the schorls. As we worked the mineralized zone with sinker holes, we would place these in such a way as to carefully expose the potential hot spots. This we did by drilling and blasting well to the side of these enrichments with the hope of just cracking or peeling into them. Using this newly established technique, we found pocket MMP2-05 on March 22 just 1 week after starting to de-water the pit. MMP2-05, although small, was a true gem elbaite pocket. 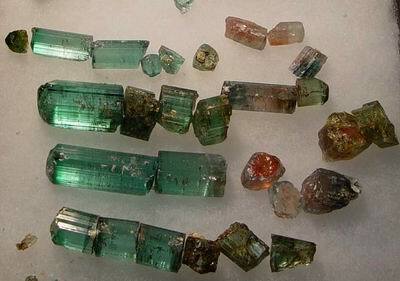 Several fine blue gem crystals very similar to the material from MMP23-04 were recovered. 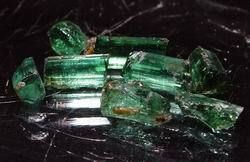 These were embedded in golden cookeite sands. We teased these crystals out of the cookeite using fine picks. We even tried our high pressure water gun to assist us in this delicate task. Near pocket two, there was a similar area of enrichment. 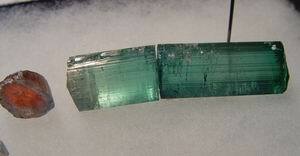 As we were to discover later, we apparently sent gem blue elbaite out to the dump. By the beginning of April Jim Clanin had joined Richard and I at Mt. Mica. Besides his gem mining background, Jim is expert in underground roof management. Neither Richard nor I wished to acquire this knowledge via the school of hard knocks. Fortunately, Jim was impressed by the competency of the schist capping rock which comprises the hanging wall. It was his opinion that we could significantly widen the drift without incurring the risk of a roof fall. We did find it was best to remove the pegmatite right to the schist as the pegmatite easily separated from the overhead schist. If there was a risk, it was that the pegmatite might delaminate from the schist if an unsupported thin segment remained in the roof. We needed only to pay attention that we did not drill and blast the schist itself as this might loosen a plate that could later fall. Although Richard and I always scaled our roof to a degree after each blast, Jim paid much more attention to this task. After each blast he spent considerable time hosing the roof looking for cracks and checking plates with the scaling bar. At times this delay was annoying; in the long run it was a comfort. As noted before we were taking the pegmatite right to the schist ceiling. If we drilled the upper holes about .3 meters below the schist, the pegmatite peeled away cleanly without disrupting the integrity of the schist ceiling. The master plan was to mine up strike and slowly turn our drift down dip so that eventually we would be further down dip than the back of pocket 28-04. Then we could reverse direction and mine towards the back of 28-04. As we advanced our drift up strike beyond MMP3-05, we no longer could peel away the schist from the ceiling. In order to locate the schist, we drilled directly into the roof at about a 45 degree angle. The schist was there but it was now 1-2m higher than before. Another anomaly presented itself as we advanced the drift. We had expected the garnet line and the entire pegmatite sheet to rise as we mined further eastward and up strike. The opposite was happening. Both the ceiling was rising and the garnet line was sinking adding to the dimensions of the pegmatite and the amount of rock we would have to move. Coincident with the thickening of the pegmatite massive lepidolite appeared near the center of our drift. We had seen quite a bit as thin wisps and plebs as we had been driving our drift. Our drift was now in 10 meters long. Besides the lepidolite, we encountered numerous small spodumene crystals to .2 meters. Just to the left (down dip) of the lepidolite we intercepted pocket 4. Pocket 4 was similar in both size and material to pocket 3. 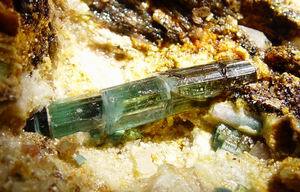 Both produced interesting quartz crystals and specimen tourmaline but little gem.